It was a normal Neopian morning, and I woke up feeling great. I changed out of my Green Koi pyjamas and Blue Koi slippers into my frilly pink skirt, and grabbed my balloon. I bounced downstairs happily. My brothers were all sitting at the breakfast table while our owner, Georgia7000_8_8_8 prepared the food. "Good morning, Froggle_3_3!" laughed my twin brother, _Froggle_14, a Quiggle, like me. Froggly__28 and FrogFrog__26, the Nimmo twins in the family, replied and my heart sank. Both items were too expensive. 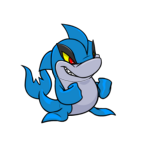 I had always wanted to be painted Island or Plushie, but eventually I realised that a paintbrush would be too much to ask for when there are four Neopets in the house. I then set my hopes on a morphing potion- I had wanted to be a Koi for years and I can't remember my life without that hope! I wanted that potion almost as much as I treasure my petpet. 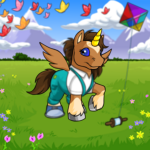 Disheartened, I tried asking Georgia again for the paintbrush I had hoped for as a young Neopet. “Wakey wakey!” Georgia cooed, and woke me from my daydream. “Eat your jelly, we’re leaving soon!” I obediently replied and gulped down my delicious glowing jelly and leapt up the way only Quiggles can. Georgia grabbed my hand and we excitedly set off for the shop. “La la la la la!” Sid the Slorg was singing as usual. Sid’s the shopkeeper that my owner employs to watch over the shop while my owner’s at home. “Oh! Hello! There’s something in the shop till this morning!” Sid said when he realised we had entered. He pointed to the cash desk. Georgia opened the till and stared down in surprise. “Froggle,” she slowly called me over. She sounded shocked. Oh no! Not a terrible Random Event! Some can be good, but all I’ve ever gotten is an illness from one of those. “Is it an event?” I asked shakily. Georgia smiled. “No,” she replied. “This is much, much better!” She beckoned for me to come closer and I peeked into the drawer where the neopoints sat. My eyes bulged at the sight of 29,955 NP resting in a corner of the drawer! Now we could probably afford a paintbrush! I hopped up and down in ecstasy as Georgia took the neopoints and put them into her purse, handing some to Sid for being a good shopkeeper. She checked the stock and then we left. Someone had bought two codestones and a piece of a treasure map from our little shop! 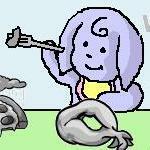 As we walked along the streets of Neopia Central and through the plaza, Georgia looked excited and I wondered why she was going to the marketplace. Usually we come here for clothes, I thought. Not now. My owner was heading for the paintbrush and morph section of someone else’s shop! I was dancing and hopping up and down as if I were crazy! “We are looking for pet paintbrushes,” explained Georgia7000_8_8_8. “Island, plushie, things like that.” The shopkeeper, a Gothic Usuki, pointed down one of the aisles. There was a large ‘SALE’ notice pinned to the end of a shelf. I looked at the labels of the items and my heart rate quickened as I saw a sticker which read, ‘Island Plushie paintbrush- only 17000 NP ’. “Georgia!” I called. “Look at this!” my excited owner rushed to come and see what I was pointing at, and gasped when she saw what I was looking at. “I don’t believe it! It’s just what you’re looking for!” she exclaimed. “Are you sure this is what you want?” I think she already knew the answer. “Of course!” I excitedly laughed. I must have spoken a bit too loudly, though, for some other shoppers shot looks at us from the aisle across from us! Full of mirth, my owner and I skipped to the checkout. When the shopkeeper asked what we needed, Georgia told her that we would take the brush. I was bursting with happiness! We walked to the Rainbow Pool, chatting about how great I’d look when I had been painted. When we finally arrived, I could hardly keep the excitement under control as I stepped into the glistening water. Suddenly a rainbow Kacheek climbed out of the pool and asked me why I was in the pool when I had no paint brush. Georgia7000_8_8_8 apologised to me over and over again, but I insisted that it wasn’t her fault. It wasn’t. It was mine. I saw the brush and was too foolish to realise what it really was. I was too greedy to check with the shopkeeper, too excited to think. I trudged home slowly with my owner, neither of us speaking, silently expressing our disappointment. When we reached our neohome, I ran upstairs to my room without stopping to greet my brothers. I flopped on my bed and hugged my petpet, Quince the millipod, tight. I must have fallen asleep, because the next thing I knew, all three of my brothers were in my room (which I strictly forbid! ), demanding to know what happened. I shooed them away, all except Froggly__28. He could give great advice. I told him the story of what happened, of how I was ecstatic and suddenly disappointed, how I made a huge mistake. Froggly listened to me, and then told me that I would get the brush one day, and still had hope. I dismally mumbled that I would never get to be painted, let alone a painted Koi. My brother was still comforting me when the doorbell rang. Floorboards creaked as all four of us ran to get the door. Apparently Georgia7000_8_8_8 had gone out to play games while I was asleep for ages, and now she was returning we were all excited to see her. FrogFrog__26 was always the most agile of us, and so he reached the door first and opened it. Georgia stood in the doorway with a bulging shopping bag in her hand and a beaming grin on her face. “I’ve got some surprises for you!” she said mysteriously, and called all four of us into the lounge. Now I am holding my Orange Koi morphing potion with a look of pure delight on my face as I tell FrogFrog and Froggle the story of my paintbrush palaver. Now they understand why I have this great gift. I remove the stopper from the bottle of iridescent orange liquid, swirling like the patterns on a Koi’s skin. I look at Georgia. She nods and I raise the bottle to my lips. The orange liquid tastes like delicious jelly, feels like silk to my lips. I feel a strange buzzing sensation and look down to my legs. Now I have a beautiful, shimmering tail which is a shade of peach. My hands are delicate, silky fins in the same colour, and my back is bright tangerine against the pale orange of my face and belly. I am finally a Koi!